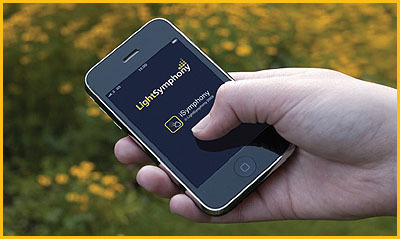 'iSymphony' is a free Apple and Android application for Light Symphpony. In conjuction with a our iPort Interface, it creates a stylish alternative to the standard Remote Control and allows you to control your lighting system using your smartphone or Tablet. The video below demonstrates the 'iSymphony' application and describes its many features. Download the app free from Apple's iTunes web store, just search for 'iSymphony' or grab the Android version here. The app requires our iPort Interface (LS30970PORT) which allows plug-and-play control when you're at home and connected to your (existing) WiFi router. The iPort also allows control via the internet or mobile phone network, from anywhere in the world, if you set up your router and IP addresses correctly. Don't worry if can't, to use it at home requires no set up at all, just plug it in!